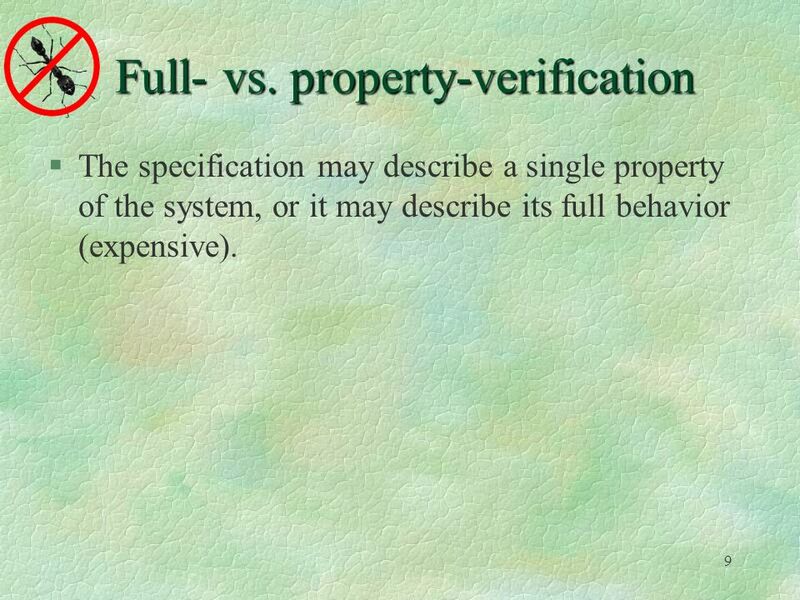 9 9 Full- vs. property-verification The specification may describe a single property of the system, or it may describe its full behavior (expensive). 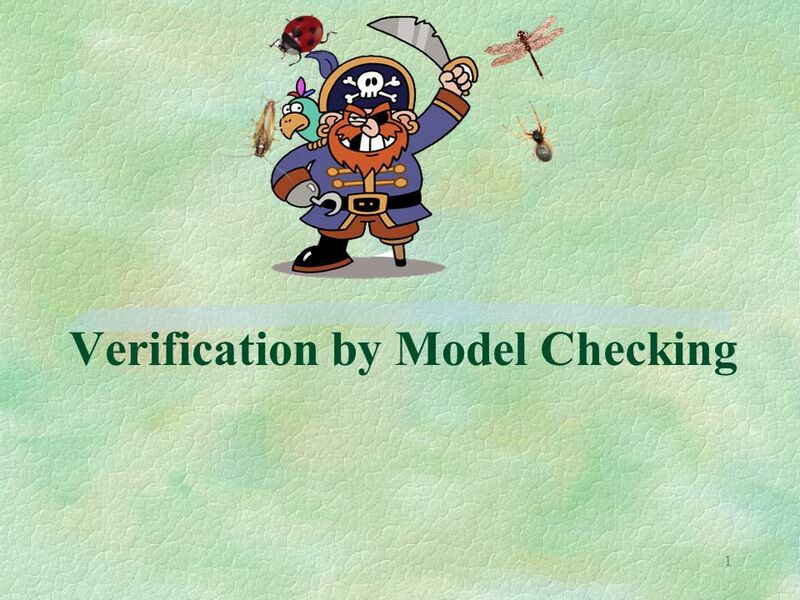 Download ppt "1 Verification by Model Checking. 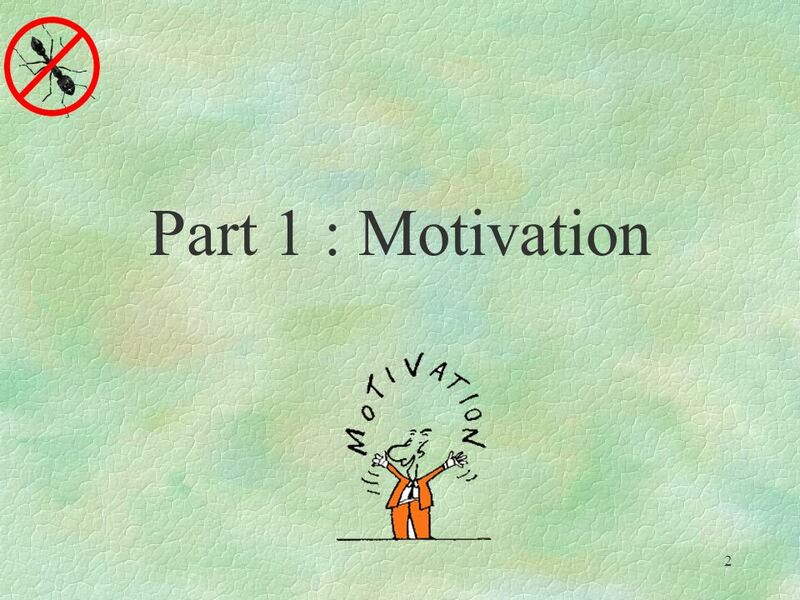 2 Part 1 : Motivation." The Quest for Correctness Joseph Sifakis VERIMAG Laboratory 2nd Sogeti Testing Academy April 29th 2009. 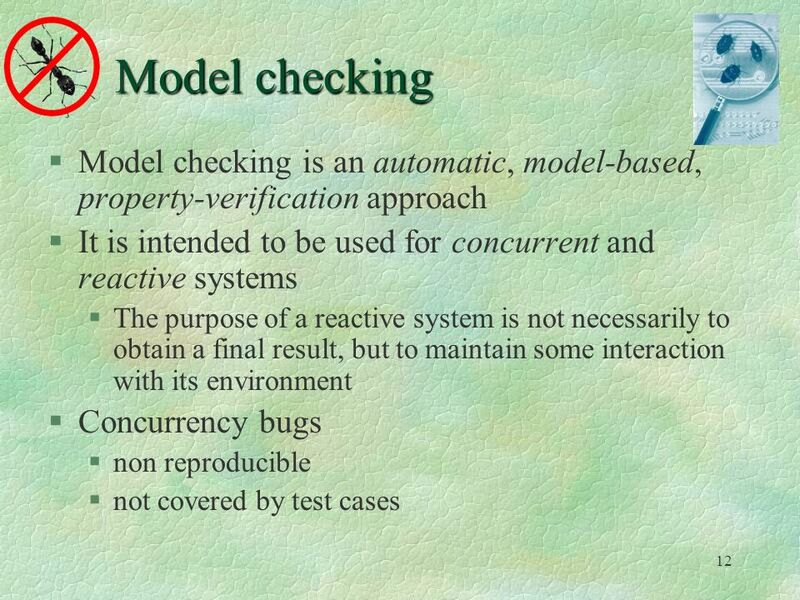 Model Checking Lecture 2. 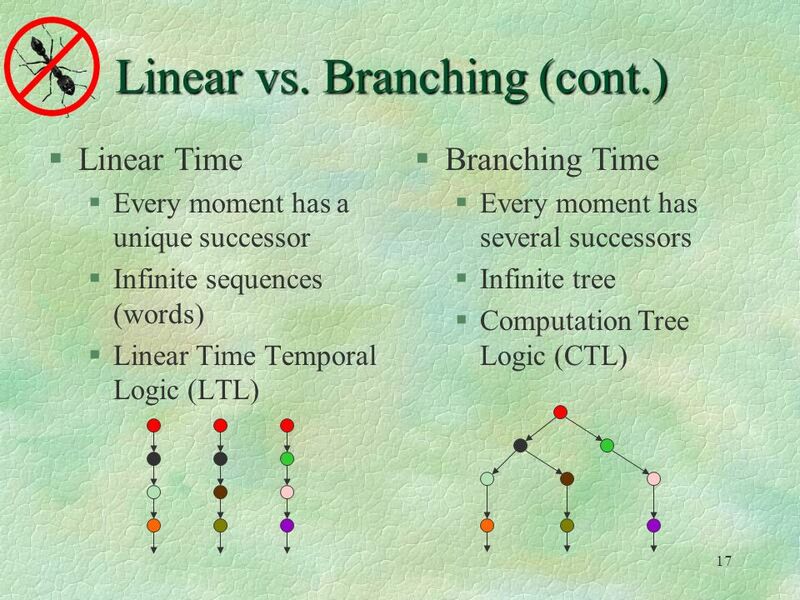 Three important decisions when choosing system properties: 1automata vs. logic 2branching vs. linear time 3safety vs. liveness. 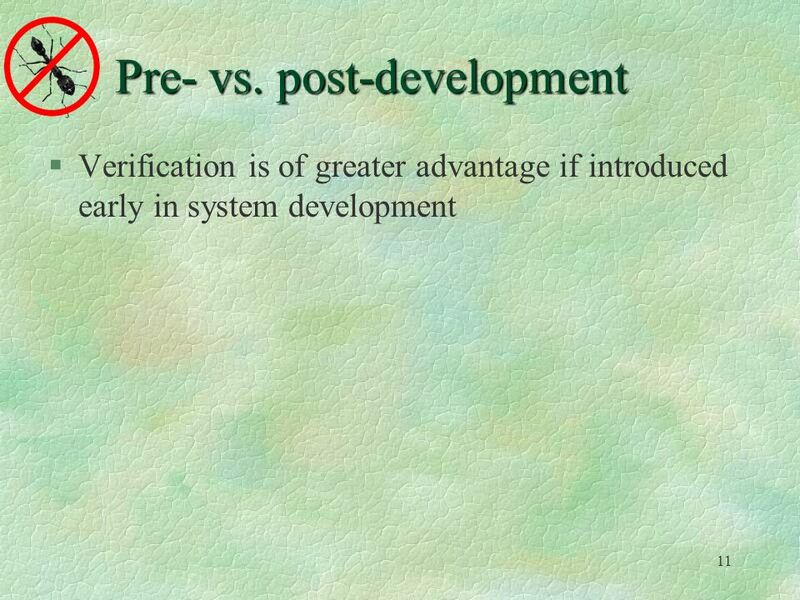 Formal Methods and Testing Goal: software reliability Use software engineering methodologies to develop the code. Use formal methods during code development. Modeling issues Book: chapters 4.12, 5.4, 8.4, 10.1. 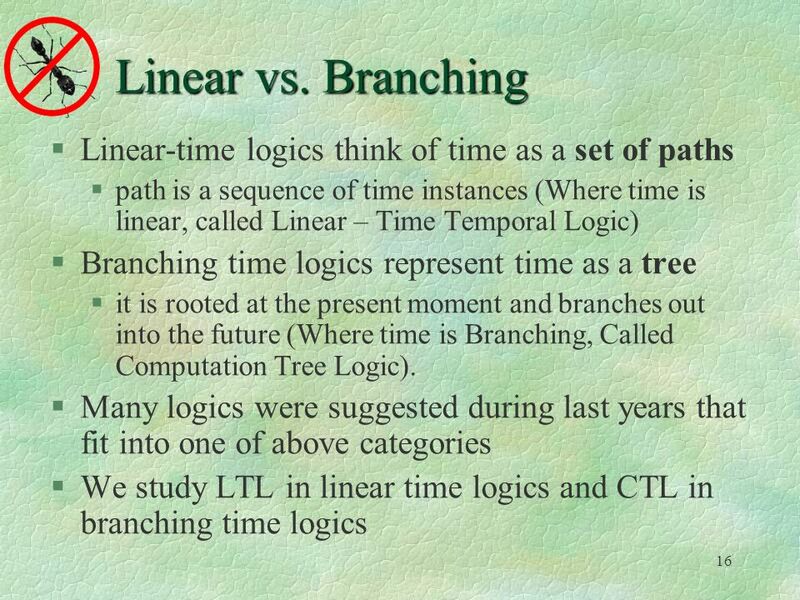 1 Abstraction (Cont’d) Defining an Abstract Domain variable elimination, data abstraction, predicate abstraction Abstraction for Universal/Existential. Tintu David Joy. 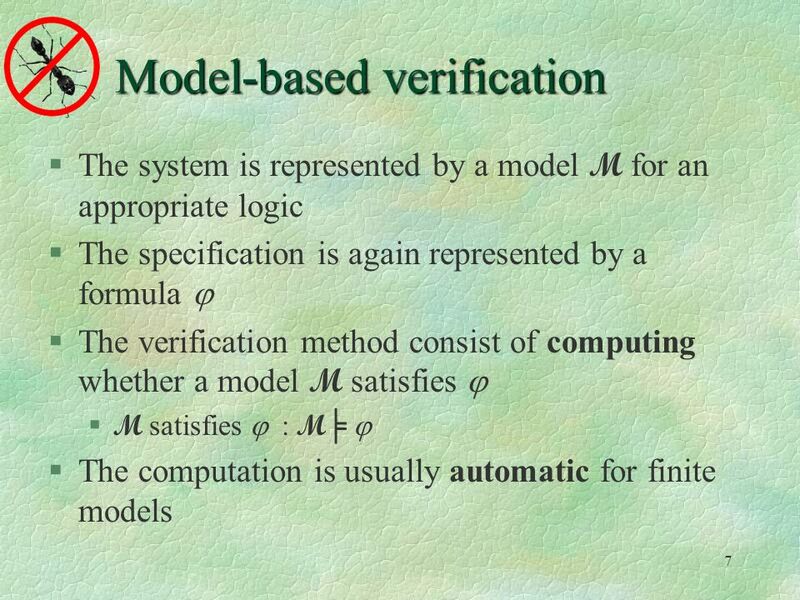 Agenda Motivation Better Verification Through Symmetry-basic idea Structural Symmetry and Multiprocessor Systems Mur ϕ verification system. 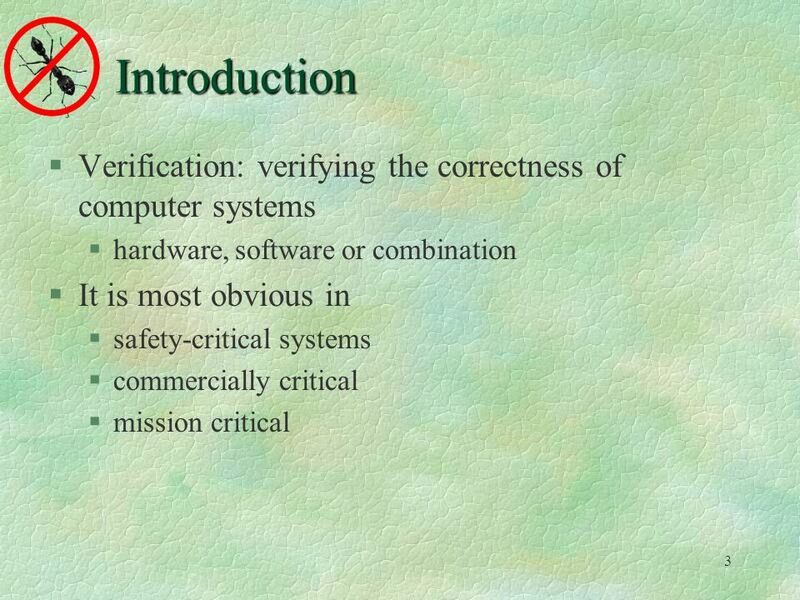 Intervenant - date Requirement Refinement to Test Case Generation for Embedded Railway Control Systems by : Ying YANG 09/06/2011 Ph.D Student French institute. OOAD – Dr. A. Alghamdi Mastering Object-Oriented Analysis and Design with UML Module 3: Requirements Overview Module 3 - Requirements Overview. 1 October 16 th, 2009 Meaning to motion: Transforming specifications to provably-correct control Hadas Kress-Gazit Cornell University George Pappas University. 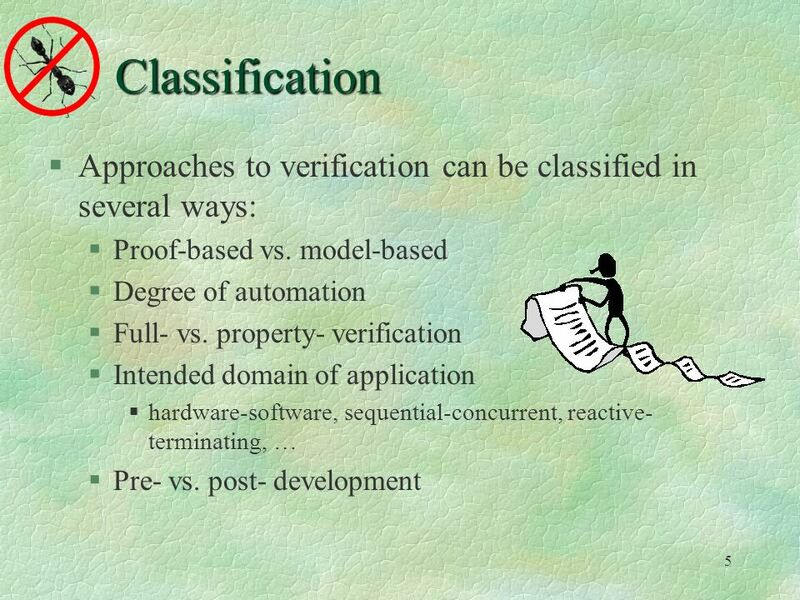 A Survey of Runtime Verification Jonathan Amir 2004. Tutorial I – An Introduction to Model Checking Peng WU INRIA Futurs LIX, École Polytechnique. M ODEL CHECKING -Vasvi Kakkad University of Sydney. 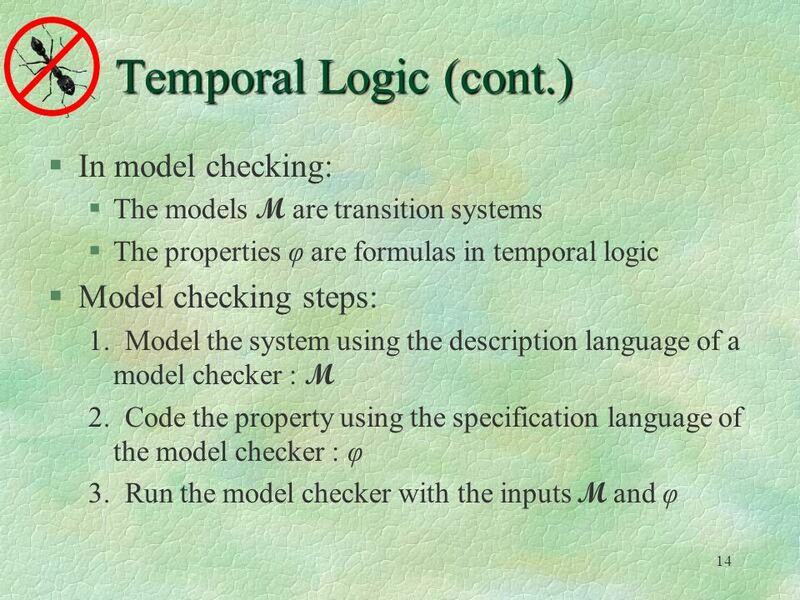 Introducing Formal Methods, Module 1, Version 1.1, Oct., Formal Specification and Analytical Verification L 5. 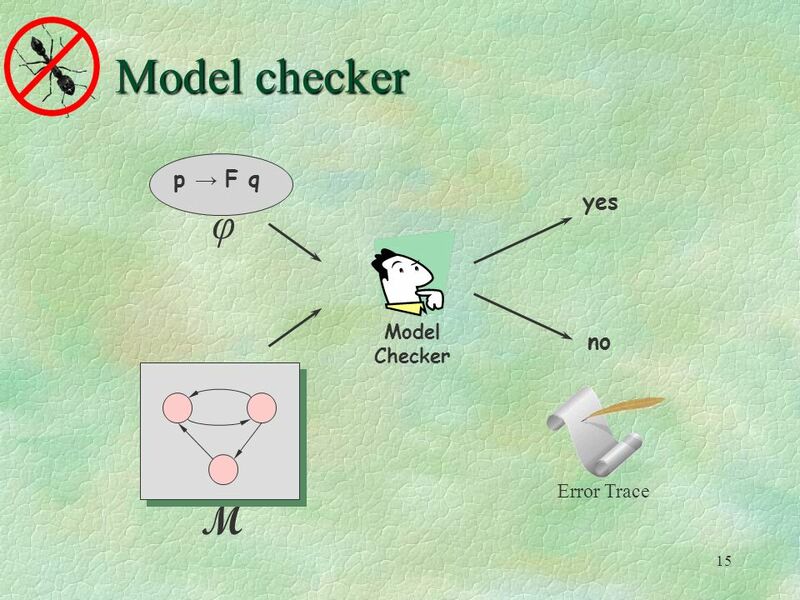 1 Model checking. 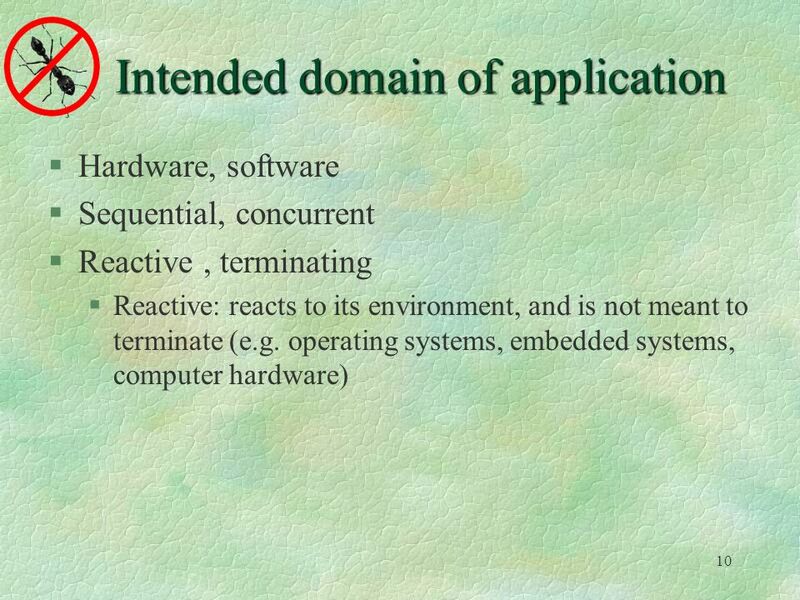 2 And now... the system How do we model a reactive system with an automaton ? 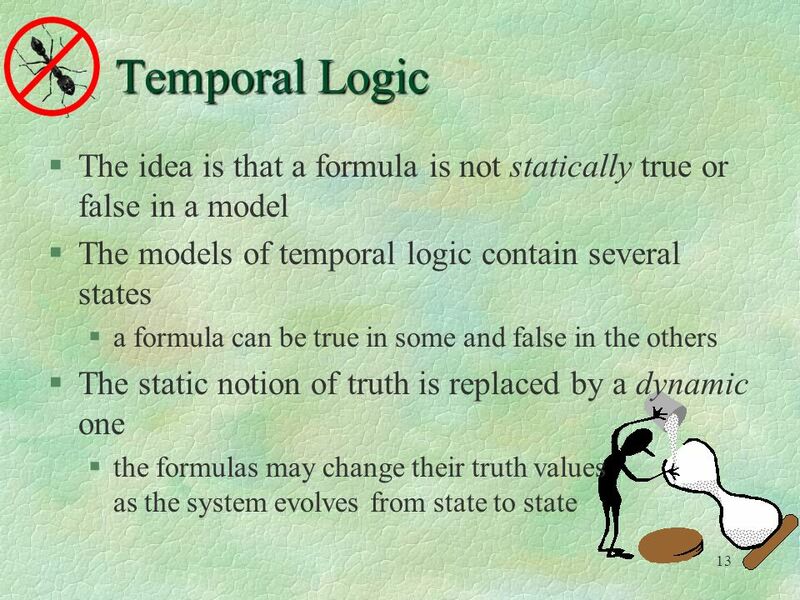 It is convenient to model systems with Transition systems. 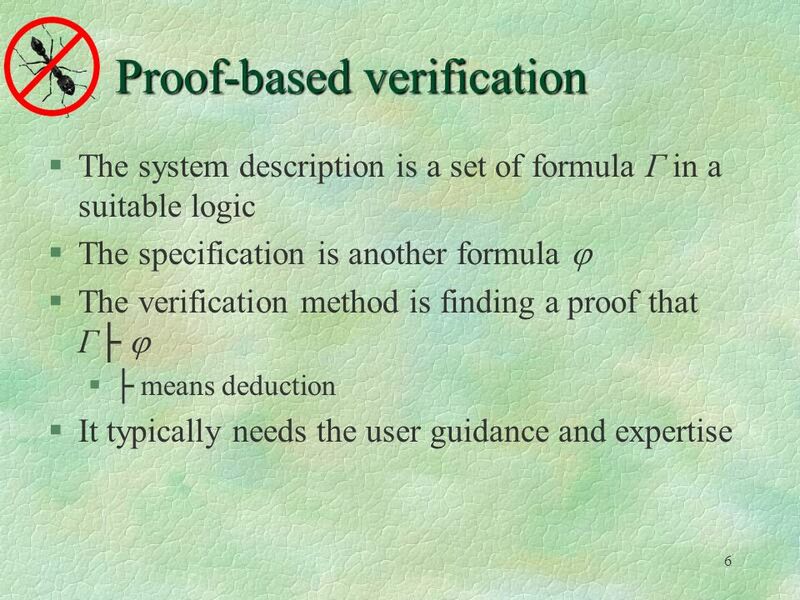 Formal Verification Lecture 9. 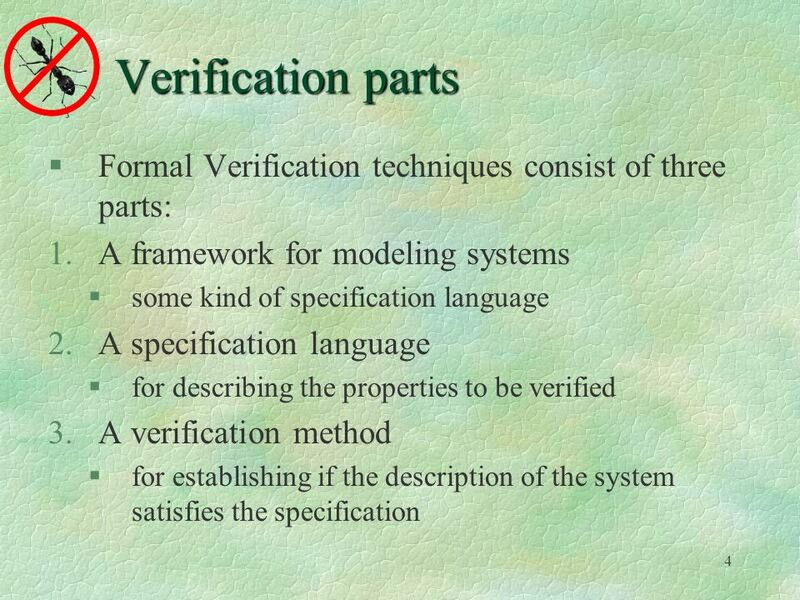 Formal Verification Formal verification relies on Descriptions of the properties or requirements Descriptions of systems.